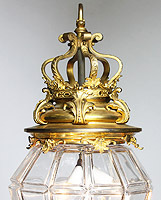 A Fine French 19/20th Century Gilt-Bronze and Molded Cut-Glass "Versailles" Style Hanging Lantern. 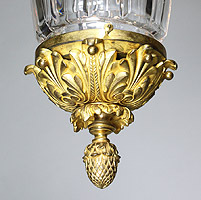 The top surmounted with a Royal Crown among leaves an acanthus, the bottle-shaped central cut-glass shade with square and rectangular shaped panels and ending with a gilt-bronze floral cap ending with an acorn. 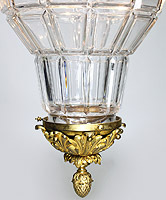 The high quality cut-glass shade maybe by Baccarat. Circa: Paris, 1900.